SINGAPORE (THE NEW PAPER) - If you follow The New Paper via the TNP app, you may have noticed some changes. If not, right now is the perfect opportunity to download and try it for yourself. 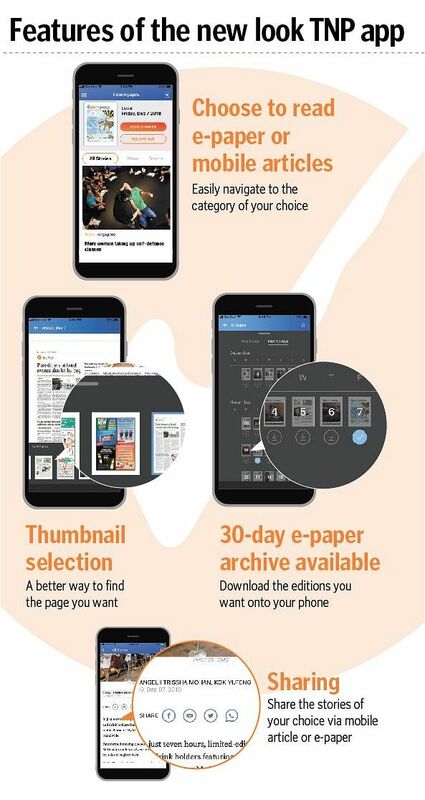 Soft-launched last month, the new-look app now lets you choose how you want to read the news - in an e-paper or a mobile article format. The app was redesigned from the ground up to improve the reader experience. There is easier navigation between stories and sections, a faster page loading time, and access to a 30-day e-paper archive - perfect if you are unable to get a copy of the print edition. And there are even more options to share articles from both the mobile and e-paper versions. In addition, there are notifications to alert you to key stories and exclusive offers. Mr Eugene Wee, editor of TNP, said: "We wanted to let our readers choose how they want to read The New Paper, so that they can pick the format they are most comfortable with." The new-look TNP app is available for download from the iTunes App Store and Google Play.